In most cases, terminology research leads to one obvious target terminology solution. But sometimes there are several options and many people are involved. How then do you make a decision? Who is the final authority? When a new target term is coined or a controversial term needs to be changed, stakeholders become extremely passionate about these questions (see also a recent discussion in the inkedIn Terminology group). I believe it is simply the wrong approach to this puzzle. Even just asking the question about authority does not help negotiations. Instead, let’s look at the process: The target terminologist does the research, because that is what they are trained and paid for. Research means accessing and evaluating pertinent resources to find the answer to the terminological problem. Resources may be print and online dictionaries, books and technical magazines, websites and terminology portals, the product itself, related products and material, and, yes, subject matter experts (SMEs). Target terminologists are the hub in the middle of a bunch of experts. Sometimes they turn out to be self-proclaimed experts or people who are simply passionate about their native language. 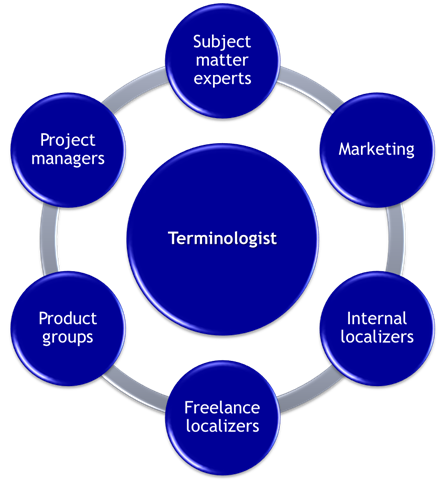 But especially in localization environments, a terminologist is a generalist and must never work in isolation. A good terminology management system (TMS) supports the terminologist by allowing knowledge sharing by others, voting, etc. Linguistic presentation—is the new term a well-motivated term? Again, the DTT/DIT Best Practice contains a well-structured list of criteria. Budgetary concerns—does changing from an old to a new term completely blow some product group’s budget and will they therefore not go for the new suggestion? Input by end-users—when the term replaces an existing term: do end-users simply not understand the old term or have a strong dislike for it? Sociolinguistic aspects—how rooted is the old term already in common parlance? And finally, in certain environments, political aspects—e.g. are enough stakeholders convinced to make the change so that it will actually be successful? It goes without saying that in each situation the criteria need to be weighted differently. For Windows Vista, for example, the German term for “to download” was changed from downloaden to herunterladen. The budgetary impact was high due to the high occurrence of the term in Microsoft material. Who had the final authority on that one? Well, a user survey conducted by the German terminologist at CeBIT in Hannover revealed that many users, even techies attending the computer fair, did not like the Anglicism. The German terminologist made the case to product groups, and the change was implemented by mutual agreement. Culture, gender and hierarchy: At J.D. Edwards, some handbooks were translated multiple times into Japanese. Each time a more high-ranking person in the Japanese subsidiary had a complaint, the books or certain portions of them might be retranslated. Similarly, there was “terminology du jour”—terms that changed based on the input of the subsidiary and with little guidance by the female Japanese terminologist. Gender and hierarchy have an impact on terminological decisions in certain cultures. Outsourcing: An external target terminologist isn’t necessarily in the strongest position. Many may not have contact with the local market subsidiary, because there is none or it is not staffed to discuss terminology. The worst case is, though, when the linguist makes a perfectly sound suggestion, but the counter-suggestion from the subsidiary prevails because it came from the client or the perceived expert. Subsidiary PMs may have strong technical knowledge, but that does not mean that they are always completely clear a) about the concept, b) about the impact of a term change, or even c) whether the term works for the end user. It is a terminologist’s job to assess how valuable the input of an expert is. Expertise and experience: Let’s face it—some terminologists don’t deserve to be called terminologists. Terms are small, if not the smallest unit of knowledge, and terminologists need to deal with dozens of them on a daily basis. Experts usually don’t get paid or have no time for terminology work. Therefore, communication better be efficient and fast. It takes tremendous skill to make a concise case and get to a solution smoothly and efficiently. In my experience, the best designations result from the work of a team of equals who draw on each others’ strength. 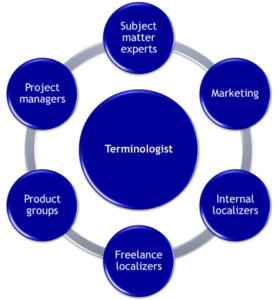 In many software scenarios, the ultimate SME does not even exist—terminology-management and subject-matter expertise is contributed by different parties to an online centralized terminology database managed by the terminologist for the respective language. What is your experience—do too many cooks spoil the terminology database? Or does it take a village?